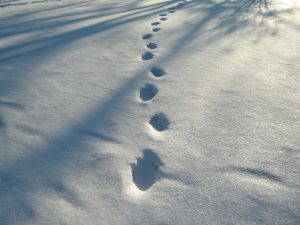 I know that God walks the path before me, but like the child following his father in the winter, I occasionally get a face full of snow trying to walk in His foot steps. The child knows that by following his father, he will get where he needs to be. But just like the father, God did not promise that there would not be obstacles in the way, only that if we followed him, he would get us where we need to be. When that face full of snow comes, you have two choices. You can lie there in the snow and freeze, or you can pick yourself up, wipe off the snow and keep following. This entry was posted in Theology and tagged Christ, fall, Following, God, moving forward, stumble on September 12, 2007 by Brian Olson.